I'd give the article a great big "Amen". 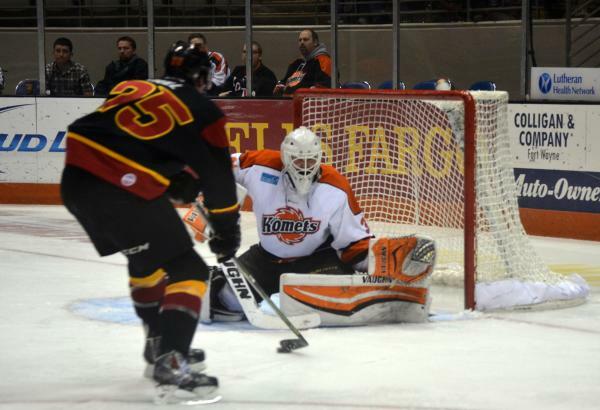 The first thirty minutes was frustrating in that the Komets really dominated play, just couldn't score. The rest of the game, (regulation and overtime) was simply pitiful. The Komets owe Nagle. He was the difference. "Playing down to the level of Indy" or is this the team as it is constructed now? We'll see, but I'm hoping that David F. has something up his sleeve. Probably too late for any weekend changes. (Yeah, I know that Schrock and Severyn are due back Saturday, but this team needs to find some "pop" on their scoring woes). Regardless, this was a game that the Komets were expected to win, needed to win, and got the two points. Nagles has sure been a great pefomer without him right now this team would be in seriuos trouble. Someone better start scoring soon or this team will be in the middle of the pack real fast. Indy totaly dominated the third period last nite. Wewere lucky to get out with the win.